Buttevant (Cill na Mullach – “Church of the Hillocks” / Cill na Mallach – “Church of the Curse”) (pop. 1,200) is a town of considerable historical interest on the River Awbeg. The scenic surroundings contain several castles and ancient megaliths. 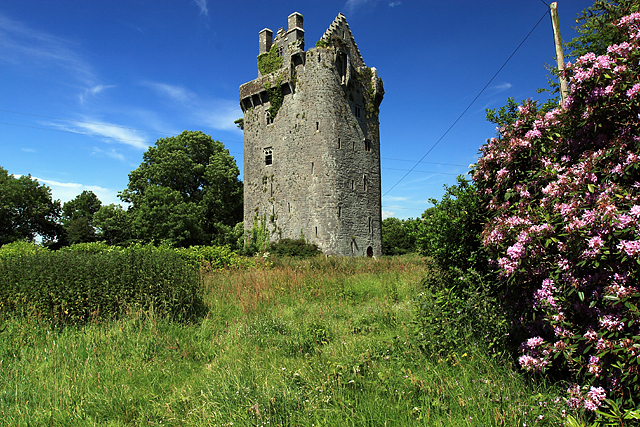 The Castle suffered considerable damage during the War of the Roses, when the de Barry Viscounts of Buttevant joined the FitzGeralds of Desmond in supporting the Yorkist cause against the Butlers of Ormond, who fought for the House of Lancaster / Tudors. A century later the de Barrys, by then Earls of Barrymore, were implicated in the First Desmond Rebellion, and in 1568 the castle was captured by Queen Elizabeth I‘s Lord Deputy Sir Henry Sidney. The Castle was sold in the late C18th to John Anderson of Fermoy, who converted into a mansion in the Gothic style in 1810, and whose son built the adjacent castellated flour mill. Although now derelict, and secluded behind mature trees, the four storey building is quite dominant in the townscape. The impressive portico is currently in very poor condition. Ballybeg Priory, built for the Augustinians in 1229, is particularly notable for its Columbarium, one of only two such medieval dovecotes surviving in Ireland. The last recorded titular Prior of Ballybeg was John Baptist Sleyne (1635-1712), Bishop of Cork and Cloyne, who died in exile at Lisbon. Buttevant Clapper Bridge, erected c.1230 for the convenience of the Augustinians, is a rare surviving example of this primitive form of bridge. In 1234 King Henry III conceded a market at Buttevant to David Óg de Barry to be held on Sundays, and a fair on the vigil and day of St Luke the Evangelist (18th October), and he settlement developed into a walled medieval town of some importance. Old documents also refer to it as Bothon, Bottoniam, Buttomam, Kilnamullagh, Killnamollucham, Ecclesia Tumulorum and Buttiphante. After King Henry VIII‘s 1540 Dissolution of the Monasteries, the friary was granted in 1574 to George Bouchier. By 1605 it was in the hands of Sir David Norton and in 1610 it was taken over by Sir John Jephson. The de Barrys protected the friars, who remained working in the area right up to the War of the Three Kingdoms, when Murrough O’Brien, Earl of Inchiquin, nicknamed Murchadh na dTóiteán – “Murrough of the Burnings”, assembled a Parliamentarian army in Buttevant and torched their church. The Franciscans returned after the Restoration. A 1731 report stated that in “a thatched house within the precincts of the Old Abbey, where one or two of the old friars have dwelt some time past, one of these lately died.” By 1800, there was only one old friar left, and he passed away soon afterwards. The great Irish antiquarian An tAthar Séamus O Conaire is buried outside the Friary portal. C19th Buttevant was a prosperous British garrison town. The barracks was destroyed in 1922. St John’s church (CoI) is officially closed but still used for occasional services. It is maintained by a group of trustees known as the ‘Friends of St John’. The Parish records are largely intact. St Mary’s church (RC) an imposing edifice incorporating a medieval tower, was designed by Charles Cotteral of Cork and completed in 1836. Anthony Trollope visited Buttevant and included it in his novel Castle Richmond; James Joyce referred to a game of hurling he played there in A Portrait of an Artist as a Young Man ; and Elizabeth Bowen mentioned it in her elegiac family history Bowen’s Court. An tAthar Peadair O Laoghaire made unflattering remarks about garrisoned Buttevant in Mo Sceal Fein; and Canon PA Sheehan of Doneraile wrote about the town in several of his novels. Ken Loach filmed The Wind That Shakes The Barley (2005) partly in Buttevant, and used many local people as extras. The Dublin-Cork railway line passes by the town, but the station, from which newly raised battalions of the Royal Munster Fusiliers and the Royal Dublin Fusiliers poignantly set out in 1914 for the Western Front, closed in the 1970s. On August 1st 1980, a train carrying 230 passengers was derailed at Buttevant when it crashed into a siding at 70 mph, killing 18 people and injuring 6 . This accident led to a major review of the national rail safety policy. Cahirmee Horse Fair has been held locally every 12th July since time immemorial, and attracts huge crowds. This is one of several fairs claiming to be the source of Napoleon’s famous horse, Marengo; a similar claim is made for Copenhagen, the Duke of Wellington‘s mount at the Battle of Waterloo. New Two-Pot-House is a small crossroads community, not far from Old Two-Pot-House Crossroads, both referring to a former landmark on the old Cork-Limerick coach road commonly called The Two-Pot-House Inn, believed to have had two hand painted signs at the entrance depicting two pint pots of ale. The local parish, widely known as Hazelwood after the principal local estate, is officially called Cahirduggan, recorded as having paid 16 Marks, the second largest sum in the Diocese of Cloyne, when Pope Nicholas IV put a levy on all parishes in the Christian world to finance the Crusades in 1291 after the disastrous Battle of Acre. Springfort Hall Hotel is an elegant Grade A Listed Georgian country house tucked away amid tranquil woodlands and beautiful landscaped gardens. 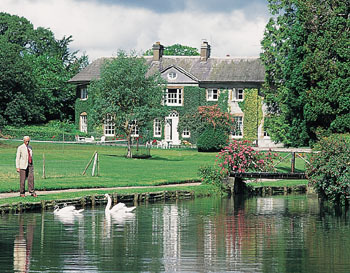 Formerly part of the vast estates held by the Roche family since c.1169, the land known as Baltydaniel was acquired c.1636 by Sir Philip Perceval, ancestor of the Earls of Egmont, and subsequently had a number of different owners and occupiers, many with strong equestrian connections. Springfort Hall was named for a stream that rises near the old fort at Pencil Hill and flows south of the house. It was purchased in 1982 by the Walsh family, who have successfully turned it into a friendly, comfortable hotel with superb dining facilities. New Two-Pot-House is north of Mallow on ByRoute 3. Long a MacCarthy stronghold, from which a Royalist garrison was forcibly removed byParliamentarian troops under Sir Hardass Waller in 1652 (destroying the top floors in the process), the castle passed by the relatively unusual route of redemption of mortgage to Sir Philip Perceval, ancestor of the Earls of Egmont, a branch of whose family occupied it for many generations, gaining the susidiary title of Barons Arden of Lohort. The castle was acquired by the international cricketer Sir Timothy O’Brien (1860 – 1928), who owned the first motorcar in the district and was famously almost bankrupted by the legal costs in an action brought against him by fellow Duhallow Hunt member David Roche, Lord Fermoy, for slander. “Sir Thady” was an unpopular landlord, partly due to his anti-Republican views. Used as a British Army observation post during the War of Independence, the castle was burned by the IRA in July 1921. It is now a private residence. Castlemagner is a parish named for a once powerful fortress built by the early C13th Norman settler, Magnel (Magner), whose descendants held sway for 400 years until 1650, when Parliamentarian troops sacked it. All that remains is a ruined tower housing a spiral staircase. It is built on a rock hanging over a stream known as Ketragh. The separate house on the property was inhabited until 1971. Knocknanuss / Knocknanauss, a townland in the northwestern end of the parish of Castlemagner, was the site of one of the bloodiest confrontations of the Wars of the Three Kingdoms. The Battle of Knocknanuss took place on the afternoon of Saturday, November 24th 1647 between a Kilkenny Confederacy / Royalist army made up of 1,800 horse and 4,500 foot soldiers, under the command of Lord Taffe, with squadrons led by Lord Castleconnell, Major General Purcell, McDonnagh MacCarthy of Kanturk and the Dal Riada Prince, Sir Alasdair Mac Colla Chiotaigh Mac Domhnaill, and a Parliamentarian army comprising 1700 cavalry and 4,500 infantry, commanded by Murrough O’Brien, Earl of Inchiquin, with squadrons led by Colonel Edmund Temple, Sir William Bridges, Major Grey of Buttevant, Major General Craig, Colonel Simon Needham and Colonel Frank Roe (total foot soldiers 3,700, all ranks). The result was a total rout by the Parliamentarians. Of the estimated 4500 killed during the three hours of fighting, more than 3000 were Confederates, with several hundred more put to the sword over the next couple of days as they attempted to flee the area. Ballyhass Lakes, formed only recently after the closure of a limestone quarry, are rather incongruously overlooked by a holiday resort village. Fed by natural springs, the lakes have been stocked with brown and rainbow trout, and crystal clear visibility makes the larger lake (12 acres) particularly suitable for training scuba divers. Ballygiblin House was probably built by Henry Wrixon, agent for Sir Philip Perceval of Lohort, owner of the townland at the end of the C16th, and also displays many features in the Cromwellian style, perhaps carried out by Nicholas Wrixon in the early C18th. The house was called after Ballygiblin near Mitchelstown, where the Wrixons had first settled in Ireland. In the 1830s William Wrixon Jr adopted his mother’s name of Becher and was made a Baronet by King William IV; as Sir William Wrixon-Becher he an estate and almost 19,000 acres in 1847, and extended the house by adding a new pseudo-Elizabethan wing. The house was succesively inherited by his eldest surviving sons, Sir Henry, who died unmarried in 1893, and Sir John who lived with his wife and 13 children at Castle Hyde near Fermoy, Ballygiblin and Assolas. Another brother, William, was a noted sailor and personal friend of King Edward VII. Upon the death of Sir Eustace Beecher, 4th Baronet, in 1933, the heavily encumbered estate was taken over by the State and sold in three lots. The beautiful old mansion was mostly demolished in 1960. Assolas House, an old mansion with a Queen Anne style façade, has an interesting history. It is said to have been a monastery before the Reformation, and a curious feature lending much weight to the theory of its religious origins is a “Leper’s Peep”, still visible. Amongst its recorded owners are Rev. Francis Gore (d. 1748), who used to hang a lantern to illuminate a nearby ford (hence atha-solas – “ford of the light”), and Sir William Wrixon-Becher, the first master of the Duhallow Hounds, kennelled at Assolas. Run for several years as a Grade A1 Guest House & restaurant with an exceptional reputation for excellence, the mansion has been a purely private residence since 2005. Glenlohane House was built in 1740 by John Sharp, a prominent Quaker wool merchant, and is still inhabited by the tenth generation of the same family, who run it as a farm and private bird sanctuary and also as a pleasant private Guesthouse; additionally, they provide limited Self-Catering Accommodation. The grounds are very attractive. Apart from family dogs and farm animals, there are also horses, ponies, fantail pigeons and bantam hens.